Hibs boss Alan Stubbs has warned potential suitors that prized asset Scott Allan is not for sale. The 23-year-old midfielder has been a standout for the Easter Road club since joining in the summer following his exit from West Brom. 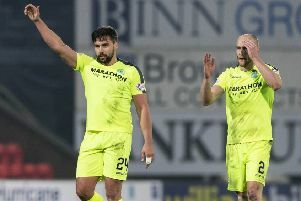 Ex-Hibs striker Keith Wright told the Evening News last week that Allan’s performance levels compared favourably with highly-regarded predecessors such as Russell Latapy, Guillaume Beuzelin, Scott Brown and Kevin Thomson, while Stubbs said the former Dundee United player was “as good as anyone in the Championship” following the 6-3 win at Dumbarton a fortnight ago. Allan is contracted to Hibs until summer 2016 and, with the January transfer window looming, Stubbs has told the Easter Road support that there is no intention at the club to cash in on their man of the moment. “When you’re playing well there’s always interest and Scott Allan is a player at the top of his game at the minute,” said the head coach. “I want there to be interest, because it means they’re doing something well. Stubbs is adamant that Mark Oxley remains his No. 1 even though he is currently casting his eye over Swedish goalkeeper Marcus Sandberg. The Englishman’s loan deal expires in January but Stubbs is confident there will be no stumbling block to extending his stay in Edinburgh at least until the end of the season. He explained that he is looking at trialist Sandberg as someone to potentially come in and provide competition for Oxley. “Mark’s my number one, it’s as simple as that,” said Stubbs. “But we do need another keeper who has got experience, just in case anything happens with Mark. We are looking to bring in another keeper that can give Mark a fight for the number one place. We are actively speaking with Hull and we’re very hopeful that something can be done. Mark’s really happy and he wants to extend his stay, which is probably going to be the main factor in all of this.